<<" March 2012 consecutively, each subscription will receive two new splits 7-inch vinyl with new and original artwork in the post every month... And because life is good the first package will include an exclusive t-shirt along with a special limited edition box to complete the set. 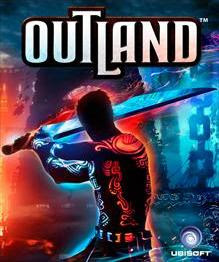 OUTLAND is a new exciting video game for Xbox 360 and Playstation 3 available exclusively as a digital download for the moment. I am a fan of old-school 2D action/platformers and this one got me really happy. First of all it has top notch, high quality aesthetics and presentation, starting as a mystical trip into the jungle guided by a shaman. Then the mechanics are precise and accurate. It is part of the new generation of action/platformers such as BRAID, LIMBO, SUPER MEATBOY, SHADOW COMPLEX, combining great story & characters with a meaty playground. OUTLAND will please for sure fans of old METROID and CASTLEVANIA games. The areas to explore are huge and the learning curve is smooth. The novelty here for this kind of game is a polarity system a la IKARUGA which combined with bullet hell-style obstacles add a totally interesting twist to the gameplay and the aesthetics. For the moment I am still at the beginning so I cannot really go in depth, but what I can say for the moment is that this one is a jewel, as well as a slap in the face for the old men whining that "video games are not done anymore like they used to". I bought it for Xbox 360 and 800 M$ points is a very reasonable amount.